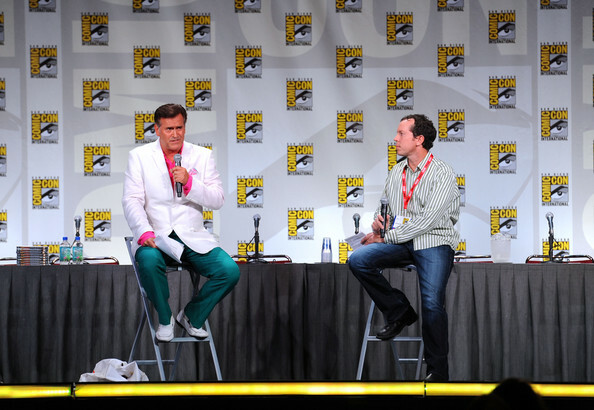 Bruce Campbell Will Make Comic-Con Appearances Even More AWESOME!!! From my inbox to yours comes the news that Bruce Campbell, everyone’s favorite horror actor and B-movie god, will be hosting a new game show ‘Last Fan Standing‘. The show will be one of the anchors for the new CONtv, a channel dedicated to the outlandish, exciting, fascinating and above all else, entertaining world of the Comic-Con circuit. Campbell taped his first episode in New Orleans during the Comic Con on January 10. The premise is straight forward, Campbell asks questions like “How much does Thor’s hammer weigh?” The top four players who answer from the crowd get to compete for the “last fan standing” moniker. “We created ‘Last Fan Standing’ to celebrate the excitement and the fandom of each audience member, while providing them the chance to compete in a live game show,” said Steve Sellery, CEO of Campbell’s Pop Quiz Entertainment, which is producing the series, and will film episodes at Wizard World events around the country. The show will debut later this year. The initial fan reaction during a live preview at Wizard World’s Chicago con was 600 screaming fans barely able to contain their excitement. CONtv will bring the feeling of a con to your living room. We will see, not only the game show, but feature films, TV shows and original entertainment targeting all of us con junkies out there. The series offerings include ‘Fight of the Living Dead‘, a horror competition series following a collective of online celebrities tackling challenges. If you’re interested in the channel it will launch as a free ad-supported platform with a monthly subscription service for $6.99/month. Subscribers will be able to access exclusive content, audience rewards and ticketing opportunities for Wizard World conventions. The channel will launch across existing services like Roku, Apple TV, Chromecast, Xbox, PlayStation, Android, Samsung smart TVs mobile and tablet devices. “We love that CONtv will be bringing the excitement and action of our conventions to fans across the country,” said John Macaluso, CEO of Wizard World. “By shooting ‘Last Fan Standing’ on location, CONtv viewers will be able to join in on the fan experience even when they aren’t able to be at the convention in person.” I plan to show up on this series sometime in the future and am increasing my pop culture and comic-book knowledge in preparation! ‘Last Fan Standing’ Is In Jeopardy! Bruce Campbell Needs YOU!!! A Journey Into Wizard World: Austin 2016! This entry was posted on Tuesday, January 13th, 2015 at 9:02 am	and is filed under Comics, Events, News, Television. You can follow any responses to this entry through the RSS 2.0 feed. You can skip to the end and leave a response. Pinging is currently not allowed. « We’ve Got The Brand New ‘Avengers: Age of Ultron’ Trailer!! !